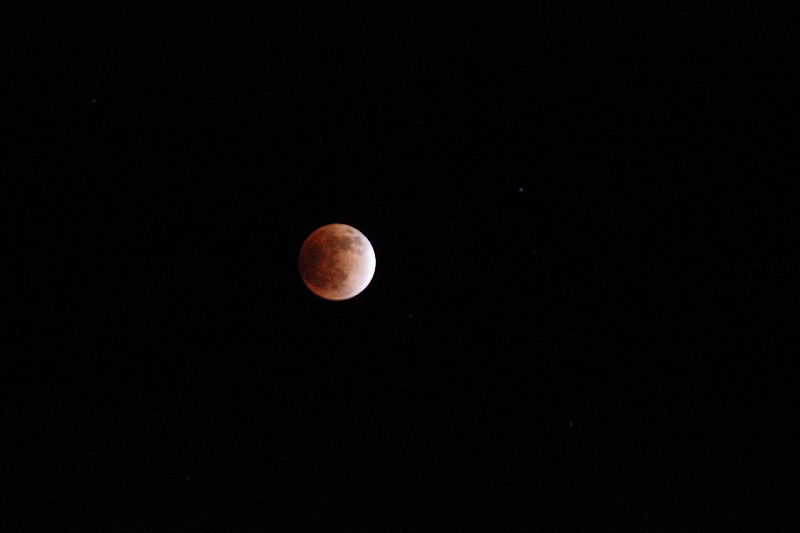 Yes, I stayed up late last Saturday to try to take a few photos of the lunar eclipse. It was spectacular here, the moon high in a mostly clear sky and sporting a deep rust-red color, which made taking photos a bit difficult. I walked down to where I usually go running, the soccer field by the gym, which has a wide-open view of the sky. I use Canon Image Stabilizer (IS) lenses on the camera. IS lenses are supposed to reduce blur when you’re hand-holding the camera in low-light and other situations, but I’d read that you shouldn’t use the IS function when using your camera on a tripod, because the lens will look for camera shake when there isn’t any. Using it with a tripod, then, will add some blur to your photos. Well, I thought that I’d turned off the IS, but when I got back to my apartment, I noticed that it was turned on. Sure enough, all the shots were a bit on the blurry side. Lesson learned–double check all settings, especially if you’re going to be out shooting in the dark. Anyway, here are a couple of shots. The first one is of the pre-eclipse moon, which I was able to shoot from my apartment, and the second is of the moon during totality, around 11:30 p.m. local time on Saturday. The only post-processing I did in Photoshop was to sharpen both images a bit. 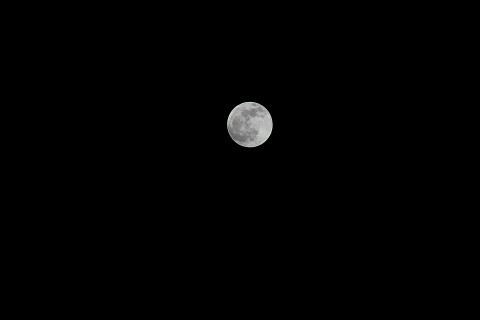 The color of the moon in the second one is as I shot it. Click on either image to get a larger view. Another astronomical event is occurring tonight. The Geminid meteor shower will best be seen between 10 p.m. local time and sunrise tomorrow morning. This annual shower has been picking up steam in recent years, and, despite the presence of an almost-full moon, some of its fireballs, characteristic of the shower, could be seen. Give it a try. Me? I’m feeling a bit lazy, but I might try to watch it from my apartment, though I have a very limited view of the sky. More later. Hey, Willie, thanks for the comment and great to hear from you. I had to use a tripod to get the shots and also set my ISO fairly high and open the lens to the max f-stop to get a fast shutter speed. Looks like the next total one will be April 15th, 2014 for North America (http://eclipse.gsfc.nasa.gov/LEplot/LEplot2001/LE2014Apr15T.pdf)How’s the bowling going? I also set ISO high and max’ed the f-stop. however, I missplaced my tripod attachment and had to try to use a mono pod. oh well.. bowling is okay. cashed in the Willey and 40&over tourney’s. 2nd high qualifier in the 40&over. out in the first two matches though. Next time you are on this side of the Planet, give me a call.